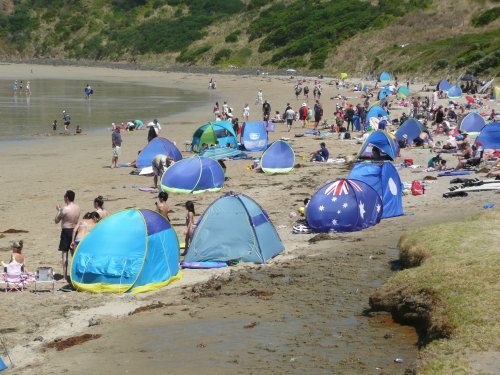 There are several popular Phillip Island family beaches. Those on the south coast are more surf beaches but attract families as well. Those on the north coast are generally more protected and therefore have calmer waters. Surf life savers from Woolamai Surf Life Saving Club patrol some beaches during the summer school holidays. Generally life guards will be on duty every day from 10.00am to 6.00pm at Cowes, Woolamai and Smiths Beach. Plus they will patrol these beaches each weekend and public holiday from December to Easter. Click here to see the map of Family Beaches﻿﻿. 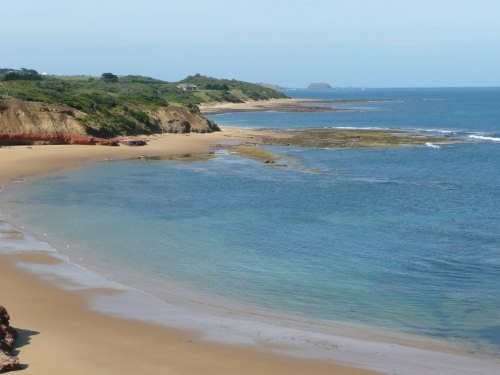 I’ll start with my two favourite Phillip Island beaches – Smiths Beach and Kitty Miller Bay…..
Smiths Beach is a beautiful, sandy crescent beach on the south coast of the island. 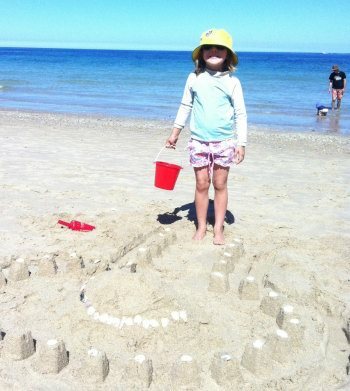 It is one of the most popular Phillip Island family beaches on a hot summer's day! The beach is great for body-surfing, body-boarding and surfing. Near the all-access ramp towards the east of the beach, is the Smiths Beach Rescue Base for the surf lifesaving patrols which patrol the beach during the summer months. Toddlers can play in the shallows or build sand castles. When the tide is out, rock pools at both ends of the beach make a ramble a must! Snorkelling is possible in the larger pools, and fishing off the rocks and beach is popular. A walk along the beach is de rigeur for children - try beachcombing to find wonderful flotsam. Smiths Beach is a very popular beach for dog walking - there are restrictions on times dogs are allowed on the beach and remember man's best friend must always be on a leash. Further to the east of the bay is Express Point. This can only be surfed when the right conditions exist, and, like a number of Phillip Island beaches, is for experienced or local-knowledge surfers only. YCW Beach is accessed from the town of Smiths Beach and is usually not as crowded as next door neighbour, Smiths. There are great views to Pyramid Rock. Kitty Miller Bay, one of the more secluded of Phillip Island beaches, is a beach for swimming, fishing and surfing. Because it has no facilities, you can find yourself the only person on the beach - a great spot to relax with just the sound of the waves and birds. Shaped like a horseshoe, at mid-tide the bay has fairly shallow, calm water. You might be lucky enough to have small stingrays swim by you, as I have! At low tide, the exposed rock pools are perfect for rambling. Along the water’s edge look for swell shark egg cases. Fishing off the rocks at the entrance is popular. 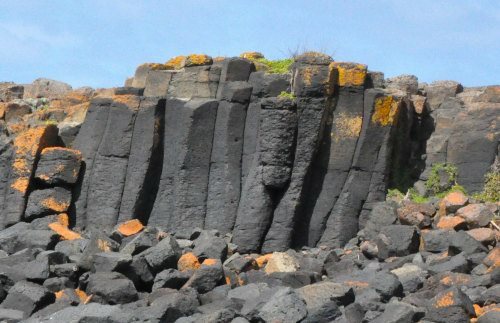 Walk around the bay to the west to explore the rock formations left from Phillip Island’s volcanic origins. Children will love searching for small cowrie shells among the tiny sandy inlets. Beware rogue waves though. 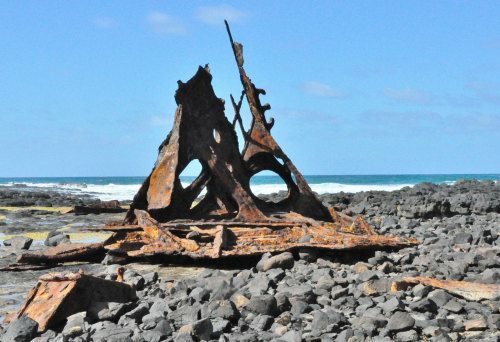 To the east, take a rough path above the rock line or walk over the rocks, and climb over the small neck to examine the wreck of the SS Speke – smashed onto rocks during a storm in 1906 and the island's famous shipwreck. One man was drowned and the captain lost his ticket for a year. The Speke's figurehead is now in the Phillip Island Historical Society Museum in Cowes. The Speke can also be reached by a track along the ridge which has great views along the coastline. There is a bit of a scramble down a steep path to reach the beach though so be careful. 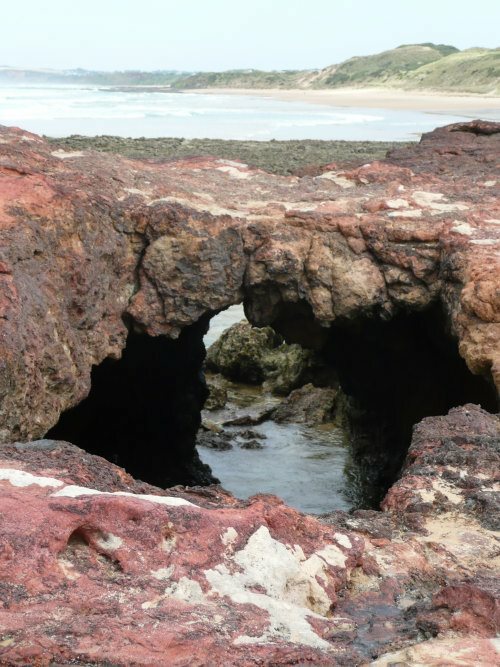 Forrest Caves, although a surf beach with dangerous currents, is also a wonderful Phillip Island family beach when exposed at low tide. Access is over the dunes via a sloping gravel path, winding past ancient moonah trees, then about 50 wooden steps to the top. 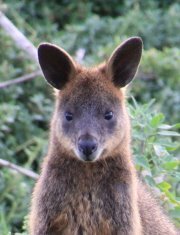 From the lookout, take in the stunning view of the coast from Cape Woolamai to Pyramid Rock. The beach is a further 70 steps down the dune face. Aboriginal middens have been found in these dunes - an insight into this ancient culture. Visit the caves at low tide, 300 metres along the beach to the left. 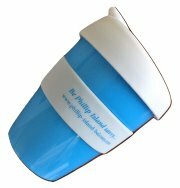 Here you can see evidence of the volcanic origins of Phillip Island. After exploring the caves and rock formations, enjoy a rock pool ramble. Snorkelling is possible in a sheltered pool behind the rocks. Watch white-faced heron hunt for sea urchin in rock crevices. Cleeland Bight Beach, Cottesloe Avenue, can be accessed by a short walk along the 400 metre track from Woolamai surf beach, or by car along Woolamai Beach Road. Take a stroll along this lovely beach to the bridge and pick your favourite spot along this beautiful bay. Relax and enjoy the views from Phillip Island to San Remo on the mainland. 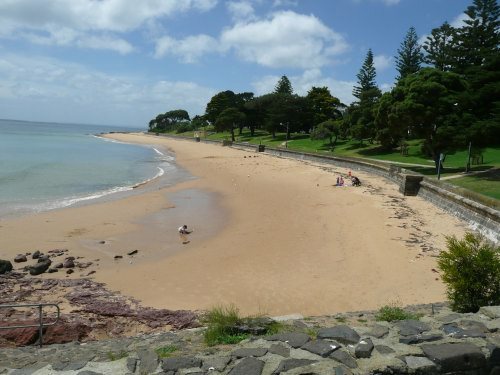 Cowes, has one of the few north facing beaches in Victoria. Of all Phillip Island family beaches, this one is the most family friendly. Generally sheltered from the southerly winds, it has lovely calm beaches from Red Rocks to Silverleaves. Children can explore rock pools near the jetty. Picnic on the lawns. Toilets and BBQ facilities are close by to the main street. At Erehwon Point, west of the jetty, is a children's playground. Ventnor is a north facing Phillip Island family beach. Accessed by stairways, it is a picturesque spot looking over the Westernport channel to the mainland. There is limited parking and no toilet facilities. The endangered Hooded plover nests here so please respect their habitat.